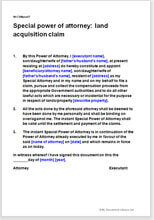 Use this special Power of Attorney template for appointing an attorney to file and pursue a claim for compensation in respect of land acquisition from the Government authorities besides delegating authority for collecting the money due by way of compensation to the same attorney. When you have an ancestral property or otherwise being acquired by the Government and you are unable to pursue the compensation claims personally for reasons of being away from the homeland or state, this doc works best to help you get your claims. Finding the right person for appointment as attorney, however, is your responsibility and prerogative. This document is for an individual wishing to set up a power of attorney in favour of another authorizing the attorney to lodge a claim, pursue the same and collect the proceeds thereof from the appropriate government in respect of a land acquisition claim. This is a generic legal document in MS Word Format, and is not specific to any country, province, or region. Extent of powers of the attorney very clearly and specifically defined.